Virtualized environments and private clouds provide your organization with undeniable benefits in scalability, agility, and cost control for your on-prem and distributed network needs. However, conventional network management tools undermine those advantages. For example, configuring DNS and IP addresses are largely performed manually using segmented point solutions. These tools are not designed to support elastic scalability. Nor can they provide the control, visibility, reliability, and consistency your organization demands. With Infoblox DDI for Virtualization and Private Cloud, you can control DNS, DHCP, and IPAM to manage complex distributed virtual and cloud-based environments centrally, flexibly, and efficiently. Now you can support complex multi-platform workloads with confidence and maximize the full potential of your private cloud and virtualization strategies. Automate provisioning and de-provisioning of IP addresses and DNS records in private cloud and virtual environments, eliminating inefficient handoffs between teams. Streamline workload distribution while gaining granular control of virtualized network properties. Boost productivity and efficiency by creating consistent workflows across VMware, OpenStack, and Docker. Automate provisioning and de-provisioning of IP addresses and DNS records in private cloud and virtual environments, eliminating inefficient handoffs between teams. Streamline workload distribution while gaining granular control of virtualized network properties. Boost productivity and efficiency by creating consistent workflows across VMware, OpenStack, Docker, and Microsoft. Automatically discover and track virtual machines (VMs) across your disparate platforms using a unified console. Monitor your workloads and their relationship to your network, while reducing the time it takes to troubleshoot issues. Streamline compliance and audit processes with insight into virtual instances, augmented with current and historical views. Automatically document VMs and their resources such as DNS records and IP addresses to keep everything up to date. 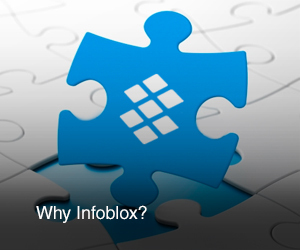 With Infoblox, you can simplify what it takes to implement consistent processes throughout your extended on-premises, virtualized, and hybrid cloud infrastructure. Apply advanced automation and centralization to ensure the uniform implementation of network policies for DNS and IP address provisioning. Empower your individual departments by distributing authorization for provisioning while maintaining complete oversight. Drive consistency essential to network security, efficiency, and reliability. We are the industry-leading platform for DNS, DHCP, and IPAM and offer more API options than any other vendor. Ours is the only platform that offers built-in adaptors, automated discovery, and out-of-the-box integration for leading virtualization and private cloud management platforms including VMware, OpenStack, and Docker – as well as Hybrid Cloud deployments using Amazon Web Services (AWS) or Microsoft Azure. We are the industry-leading platform for DNS, DHCP, and IPAM and offer more API options than any other vendor. Ours is the only platform that offers built-in adaptors, automated discovery, and out-of-the-box integration for leading virtualization and private cloud management platforms including VMware, OpenStack, Docker, and Microsoft – as well as Hybrid Cloud deployments using Amazon Web Services (AWS) or Microsoft Azure. Automate the provisioning of DNS records and IP addresses for virtual machines with pre-built integrations for different cloud platforms including VMware, AWS, OpenStack, and Microsoft Azure. Manage and visualize your DNS and network configurations on a unified UI or via APIs. Provide local controls and empower individuals or departments by delegating DNS and IPAM authorization to these departments. Provides the industry-leading DNS, DHCP, and IP address management platform with centralized management across the Infoblox GridTM. Infoblox Cloud Platform Appliances provide the same DDI features with the powerful addition of handling API call locally, which provides better scalability and local segmentation for cloud deployments. Audits and discovers cloud virtual machines and instances across multiple platforms within a consolidated, single view. Actionable intelligence can automatically assign customizable DNS records when virtual machines are discovered—without manual intervention. Empowers DNS and IP address provisioning with pre-built integration with platforms including VMware, OpenStack, and Microsoft. The API integration allows new VMs to be created. In addition, the workflow automatically communicates with Infoblox DDI for the correct DNS record and IP address without the need for opening tickets or performing manual provisioning across multiple teams.